The easiest way to record music and audio of all audio sources on Windows. Leawo Music Recorder 2.0 was available as a giveaway on November 14, 2015! Leawo Music Recorder provides the easiest way to record music and audio of all audio sources on Windows. It is a very useful tool for music lovers which can record Mic audio and other audio streams. It can be a computer audio recorder, an online music recorder and record music from Last.fm, iTunes Radio, BBC audio, Pandora music ets. Save recorded audio files in multiple formats, such as MP3 or WAV. Leawo Music Recorder also provides a Task Scheduler to set the recording start time and duration. The program can also add tags, album cover, song name, artist and adjust them manually via the internal editor. Apply recorded music files to iTunes music library with one click. How would you improve Leawo Music Recorder 2.0? search by writer, singer/band, title, etc.. Developed by Online Media Technologies Ltd.
Downloaded and installed fine on XP. Seems to be a very nice software. Structures recorded files into their own directories by titles, Tagging and a player. Also seems to handle any buffering / pauses during streaming without breaks when playing back. Nice feature. Don't see any negatives and not sure why this hasn't been rated higher. Works great for me. Thanks for a nice keeper! I have tried many of these sound recorders, including Audacity, and this is the first that ACTUALLY WORKS on my Lenovo laptop. The virtual speaker driver is the reason it works, as my laptop does not provide a driver that allows any other software to capture audio. This giveaway asks to install the driver when I attempted a recording test, and installed 21 files to my startup set. I then started recording, then started the steaming source and it indicated it was capturing the sound - moving spectrum display - was then able to replay the saved files - thanks LEAWO !! I have tried many of these sound recorders, including Audacity, and this is the first that ACTUALLY WORKS on my Lenovo laptop. The virtual speaker driver is the reason it works, as my laptop does not provide a driver that allows any other software to capture audio. This giveaway asks to install the driver when I attempted a recording test, and installed 21 files to my startup set. I then started recording, then started the steaming source and it indicated it was capturing the sound - moving spectrum display - was then able to replay the saved files - thanks LEAWO !! tried both leawo and default sound for play back, both produce the same effect on the recorded audio. while choosing leawo audio its not producing any sound while recording. its recording only noise... on windows 10, tried both leawo and default sound for play back, both produce the same effect on the recorded audio. while choosing leawo audio its not producing any sound while recording. I tried the previous version 1.1 of this software. It worked smoothly for me, and initially I though it was quite good. Then I noticed that all the recordings it made had a slight hitch in the sound every 10 seconds or so, ruining the recording. Let's hope this version is improved. Yes, that problem is fixed in version 2.0. But it still doesn't restore the original default Windows sound output on exit. Yes, that problem is fixed in version 2.0. But it still doesn't restore the original default Windows sound output on exit. Leawo Music Recorder installed without any problem on my XP SP3, and I found it to record my music streams PERFECTLY without a hiccup! Song tracks titles and art also worked seamlessly. I am VERY PLEASED, and do not know why there are so many negatives on this as I myself could not ask for anything more! Maybe it is the blessing of an older system like mine, who knows... but for me it is a definite KEEPER! Is there any correlation between thumbs up/down and comments? Most comments are negative due to various problems. Yet, 73% thumbs up?! Huge discrepancy. People giving thumbs up...what are these based on? Is there any correlation between thumbs up/down and comments? Most comments are negative due to various problems. Yet, 73% thumbs up?! Huge discrepancy. People giving thumbs up...what are these based on? It has not been offered this year as of yet so hopefully it's coming up soon. I suggest anyone looking for a program like today's watch for Audio Record Wizard to be offered. Of course it is always available for purchase at anytime and the price is a bit less than today's offer! I do not work for this company or any other. Just passing on the info about a giveaway here that many others seem to be very pleased with also. Check out folks reviews of the last version at the giveaway link above. Of course everything is not for everyone but it may be just for you! I also had serious issues with this program in a previous install and will not be downloading it. Audacity is a nice open-source program although there's a slight learning curve. You'll also need the Lame encoder to use it. If you're seriously looking for a similar program I'd recommend All Sound Recorder Vista. I had it from a previous giveaway and lost it. Liked it so much that I got the paid version. Maybe if enough people issue a request for a rerun of ASRV, they'll come back. If they do, GRAB IT. Will LEAWO record from a Casio keyboard to my PC? I used AUDACITY to do that perfectly, My casio keyboard c(SA - 21) is from way back in the 90s. Audacity was also used to make it a "stereo" track instead of being a mono track. I used AUDACITY to do that perfectly, My casio keyboard c(SA - 21) is from way back in the 90s. Audacity was also used to make it a "stereo" track instead of being a mono track. Pat, I don't use LEAWO, but Audacity definitely will record once you have your keyboard connected to your PC.. Most (all but one which recommends another products) of the posted comments are quite negative and yet this product has a 75% UP rating. Something is wrong here. Happens every time LEAWO offers something here. Buggy software with minimal functionality, but tons of up votes. Every time LEAWO offers something here that I've downloaded, it reverts to 'trial' status in a month or two despite no updates or even net access. Every time LEAWO offers something here that I've downloaded, it reverts to 'trial' status in a month or two despite no updates or even net access. Why bother? 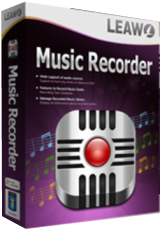 [ I downloaded this software Leawo Music Recorder Version 1.0 from another giveaway website on 27 July 2013. Installed, activated and tested it. Unfortunately this software proved to be very lousy. It was so bad that I made a note of it in a text file. So that the next time it was offered as a giveaway in the same website or elsewhere, I can remember and avoid it. That is how I remember what a piece of junk it was. Bad experience previously. Unfortunately it seems to interfere with your other software. You are better off without it. But hey, no harm trying if you do not believe. If it does not thrash your PC, then good for you. YMMV. If it damages your PC, do let us know in comments feedback. This was my previous comment: <i>[ I downloaded this software Leawo Music Recorder Version 1.0 from another giveaway website on 27 July 2013. Installed, activated and tested it. Unfortunately this software proved to be very lousy. It was so bad that I made a note of it in a text file. So that the next time it was offered as a giveaway in the same website or elsewhere, I can remember and avoid it. That is how I remember what a piece of junk it was. Comment by ric — October 11th, 2013 at 6:45 am]</i> Bad experience previously. Unfortunately it seems to interfere with your other software. You are better off without it. But hey, no harm trying if you do not believe. If it does not thrash your PC, then good for you. YMMV. If it damages your PC, do let us know in comments feedback. Indeed. It messed my Win10 system up. I will definitely not be bothered to adjust my sound device settings every time I boot. <cite>resorts to installing a fake speakers driver that the program uses to siphon off the audio data stream, it may work but adds latency to the sound making sound out of sync with watched video and potentially introduces instability of a non-MS approved driver into the driver chain</cite> Indeed. It messed my Win10 system up. I will definitely not be bothered to adjust my sound device settings every time I boot. Fortunately it uninstalled clean. In order to record programs audio output it resorts to installing a fake speakers driver that the program uses to siphon off the audio data stream, it may work but adds latency to the sound making sound out of sync with watched video and potentially introduces instability of a non-MS approved driver into the driver chain. Plus only allows 16-bit samples instead of upto 24-bit or whatever the current sound system is set to. I would have preferred them to use WASAPI. Also during operation an unknown smal 7kb tiger.exe is spawned for no readily apparent reason. The file has no description or version information embeded which is bad programming practice for legitimate developers IMHO. It ONLY records to mp3 or wav file format that is it, the use of "multiple formats" in the sentence is to vaguely imply more than the choice of mp3 or wav after all two is more than one and JUST qualifies as multiple. If i need to record ongoing sound sources on my system I'll use audacity in the WASAPI record mode and capture at the native rate my systems set to and not add potential instability and latency of a Tee Pseudo soundcard driver into the mix. A comprehensive video editing suite. A dragon-slaying adventure roleplaying game. Ram Booster Gives You High-end Boosting Technology.